Blue Ridge, Texas, Falls County. 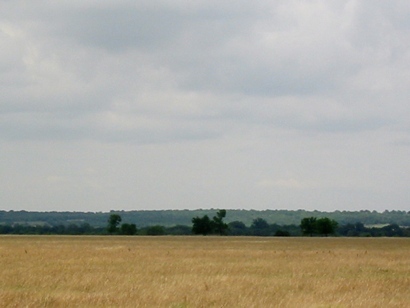 According to information from the Handbook of Texas Online, the name is derived from "low hills in the area." There were two other Blue Ridge communities in Texas - one in Collin County and one that had been in Fort Bend County. Residents of the area objected to the boundaries planned for the newly-formed Falls County around 1850 and thought that Blue Ridge should be the county seat. All that they managed to accomplish was a one year delay in the organization of Falls County. The community had a post office for a few years before the Civil War and it may have developed into a sizeable town had it not been bypassed by the railroad in the 1870s. During the period of intense school-consolidation following WWII, Blue Ridge's school merged with the Marlin Independent School District in 1948. "For what seemed like years I used to look at the rise to the south of our farm that was called Blue Ridge. It impressed me as a place you could go and look down at the beautiful view of the valley below. Then one day my dad said he had to go see somebody about some business at Blue Ridge and I was allowed to go with him. With every mile I anticipated the thrill of reaching that Shangri-La in the clouds. After a while dad stopped the car and conversed with a man for a few minutes and then got back in the car preparing to return home. I asked him why we didn't go to Blue Ridge and my dreams were shattered by his answer, "Son, this is Blue Ridge". I got out of the car and looked around and it didn't look any different than Spunky Flat....no panoramic scene, no breathtaking view. I told my wife this story and she looked surprised. She had the same thing happened to her when she lived in Spunky Flat."